US President Donald Trump visited the Mexican border on Friday to deliver a message to would-be illegal immigrants and asylum seekers: don’t bother coming. Shortly after, Trump visited a section of recently refurbished border wall — something he wants extended across far more of the US-Mexico frontier — and said illegal immigrants had previously been “pouring” in. 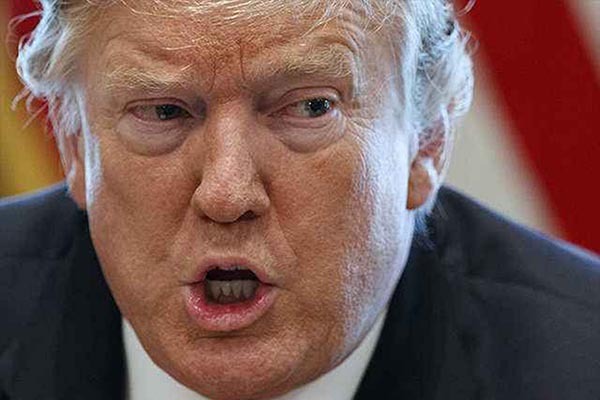 Nevertheless, Trump sees his campaign against a “crisis” on the border as key to his 2020 reelection bid, and his time in Calexico was meant to keep that message in the headlines. On the US side, dozens of people lined the road that Trump’s motorcade took, demonstrating support for his policies. “Build the wall,” said one placard. Before leaving Washington earlier Friday, Trump said that his previous threats to shut down the border had been successful in persuading Mexican authorities to clamp down by stopping migrants on their journey north. “Mexico, I have to say, has been very, very good… over the last four days since I talked about shutting down the border,” he said. Trump reiterated that actually closing the border is not currently in the cards, but said he will instead impose 25 percent tariffs on auto imports from Mexico if illegal migration and drug smuggling are not controlled. Trump also said he could still order the border closed later. “I may shut it down at some point but I’d rather do tariffs,” he said. While sounding tough, Trump’s surprise shift this week to tariffs from the previous threat to close the border is a major climb down. For days, the White House had been signaling that he was serious about the threat and there was even speculation that he might announce a closing during his Calexico trip. However, the idea caused alarm among economists and Congress, including in Trump’s Republican Party. Mexico is the third-largest US trading partner and any hold-ups at border crossings would have an immediate impact on trade. The tariffs idea is also causing confusion. On Thursday, Trump indicated there would be a one-year deadline for Mexico to improve the situation before tariffs kicked in. However, it was not clear if he meant that both for the drug smuggling and migration, or whether he wanted the migration issue resolved immediately. On Friday, the timing was no clearer. But he seemed to suggest that he might seek to punish Mexico at any time he thought the southern neighbour was not doing enough. “We’re going to shut (the border) down if we have to. We going to tariff the cars, Mexico, if we have to,” he said. It was also unclear how such tariffs would fit into the countries’ deeply intertwined trading relationship, which is governed by NAFTA, a free trade accord also including Canada that is due to be replaced by an updated version called the USMCA. As a Tibetan Amerian, I fully support Trump. USA is full up. We have our own problems to solve such as housing shortage and unemployment. We can’t look after third world refugees. Most refugees and immigrants are same. They come to US seeking asylum. But they don’t return home to rebuilt their poor countries. They try to get green card first, then US citizenship,and hardly return home. Dalai Lama says Tibetan refugees should return home, whether India or Tibet. But we know most Tibetans have no plan to return home, but settle in the USA.